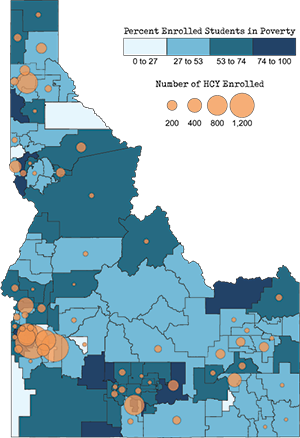 This map shows the correlation of poverty to homelessness in the state of Idaho. Statewide, approximately 47% of students qualify for free and/or reduced price lunches. National data trends show that approximately 10% of students qualifying for free lunch may be living in homeless situations. In Idaho, we have students who have been identified as homeless living throughout the state in both urban and rural areas - though our more urban areas have a larger number. Higher population areas with higher homeless percentages include: Coeur d’Alene, Boise, Nampa, Caldwell, and Twin Falls. Additionally, students qualifying for free lunch are equal to 130% of the Federal Poverty Level and students qualifying for reduced lunch are equal to 185% of the Federal Poverty Level. Homeless - Where are they Staying? Information comes from the district reported numbers.